You’ll have to forgive me, this is probably going to be a rambler – feel free to wander off now, no hard feelings. The thing is this, people have been coming up with words to focus on for the year, declutter seems popular, simplify I’ve seen a few times, you may have your own. I haven’t had a word for 2015, well not until now, but perhaps I might just have stumbled across one – and I’ll tell you straight away, it’s IDENTITY. The first outing was the TV series with Grayson Perry – Who Are You? It’s no secret that he’s a hero figure for me, but even still, watching the programmes where he spent time with various people, delving into their identities and self-perceptions, then producing artworks to reflect his take on each, was a masterpiece – of art certainly, but also in my opinion, of his ability to penetrate through the outer layers and reach inside the character of each sitter. I knew he was a brilliant artist, but here was also someone able to listen, observe and understand, if not dispassionately, then at least non-judgementally, a disparate group of individuals. It was humane and beautiful. Just before Christmas I went along to the National Portrait Gallery and saw his artworks for myself. Simply stunning, although the piece I would most like to have brought home, was A Map Of Days – his own vastly engrossing and unconventional self-portrait. So, I suppose the thread of identity started with Grayson Perry and then lay dormant for a few weeks, waiting for me to pick it up again when the BBC started all the Wolf Hall business. Although in between was a little strand from Last Tango In Halifax, with Derek Jacobi – let’s just hold that one for a moment and come back to it. I wasn’t going to watch Wolf Hall. I’d loved reading it so much, I didn’t believe the TV production would live up to what the words had created in my imagination – how wrong I was. I ‘happened‘ to watch the first five minutes of the first episode and that was that – hooked, 100% mesmerised. But watching it brought back thoughts from the time when I read it – how can Hilary Mantel convince us so well that Thomas Cromwell was a sympathetic character, when history, and more importantly Hans Holbein shows us such a different face. This was precisely the theme taken up in the Culture Show Special: Holbein: eye of the Tudors, with Waldemar Januszczak. In the famous portrait by Holbein of Thomas Cromwell, what do you see? I spent over forty years looking at that image and seeing a hard man, a ruthless man – which you’d have to say, considering what he did, must have been true? And yet, Mantel has convinced my heart that this is not the character of the man, so captivatingly portrayed by Mark Rylance in the TV series. Who is right – what is the truth – where does identity lie? Is there an inner and an outer identity? Thinking about Cromwell and that portrait made me think about another question of identity. Have you read The Daughter of Time by Josephine Tey? It’s the fictional story of Alan Grant, a policeman laid up in hospital, who for the want of something to occupy his mind, investigates the life of Richard III. It starts with him seeing a portrait of the man and being unable to reconcile the moderate, benign features with those of a child murderer. He proceeds to conduct an investigation from his hospital bed into the crimes of Richard – looking at who else might have murdered the Princes in the Tower – who stood to win and lose. If you haven’t read it – do! That’s another thread by the way – we’ll come back to it too. Where were we – oh yes, Wolf Hall. So, we’re extremely lucky to have a neighbour who brings us the weekend newspaper supplements every week and in the lead up to the airing of Wolf Hall, you’d be hard pressed not to have read something about it, the story, the locations and the actors taking part. One of the pieces I read, was about Mark Rylance. In the article, it mentioned that Rylance was one of the founding members of The Shakespeare Authorship Coalition – a body set up to formalise the acceptance of reasonable doubt as to the identity of William Shakespeare. So, my interest was well and truly piqued, thus, I’ve spent a little time this week delving further into the murky world of Shakespearean intrigue. It seems there are people who fervently believe that Shakespeare – the man from Stratford, was absolutely the author. There are others who doubt that he was the author, but don’t know who the real author was, and there are those who believe he wasn’t the author and do know who the real author was. I love a good whodunnit – or in this case ‘who wrote it’. I feel a quest coming on. Anyway, I’m now looking forward to reading as much as I can about the evidence on all sides. Today I’ve ordered a couple of books to get me started on my quest, but if I’m lucky this could keep me busy for the foreseeable future! I think the prospect of insanity has been mooted for those getting caught up in this debate, well, I’ll risk it. I’m well practised in untangling mingled yarns – I’m not sure that this one is ever likely to be unraveled, but nevertheless, it looks like an excellent mess to be mixed up in. I’m hoping to post about how this quest progresses over the year – anyone interested, do leave a comment – and if you’ve already completed your own Shakespeare quest, I’d love to know what you’ve discovered. I’m denfinitely interested in hearing what you uncover in your Shakespeare identitiy unravelling exercise! I read a little about the controversy, many years ago when writing a paper for school, though not enough to have an opinion. But in all truthfulness, I am positively thrilled to read about Wolf Hall … I loved that book and was also suprised to have my understanding of history so thoroughly altered. I hadn’t heard it was made into a series but now I will definitely look forward to it crossing the Atlantic! Oh believe me, you’re in for a treat when it reaches you. No one could have been more sceptical than me that anyone would do the book justice, but they really have – Mark Rylance as Cromwell, Damien Lewis, amazingly good as Henry VIII, Anton Lesser as Thomas More – brilliant, but the locations, the attention to detail in the authenticity of the period sets and for me the lighting all make it simply wonderful. I googled it about found the (very short) trailer… it’ll be over here in April. I’m so excited! I’m also looking forward to your reports on the Shakespearean identity mystery! leaves wide open thinking spaces…. and isn’t there a slight, slight chance that we might be disappointed with the built outer layer? As a previous visitor to your blog, I was initially enticed to look again this time by your lovely new banner – such delicious colours – and then was treated to this thoughtful and thought-provoking post. I can’t offer you any pointers in your quest but, as you say, it really does not matter a jot who actually produced all those wonderful words (as in the name of the person) … especially as I think those words are his (or her) identity, set down for all time forth for us to relish and ponder over. Thank you Margaret. It’s true – the works are inviolate – speculation about the author on the other hand, is like a wonderful historical mystery challenge – I imagine Poirot gathering all the possible candidates onto he stage at The Globe and delivering his verdict! Something to engage the little grey cells for a while. I’m certainly interested. There are plenty of examples in art history of work being attributed to the master when in fact it was undertaken by a pupil or some other associate or connected person, why should the plays of Shakespeare be any different? Mark Rylance … brilliant man! 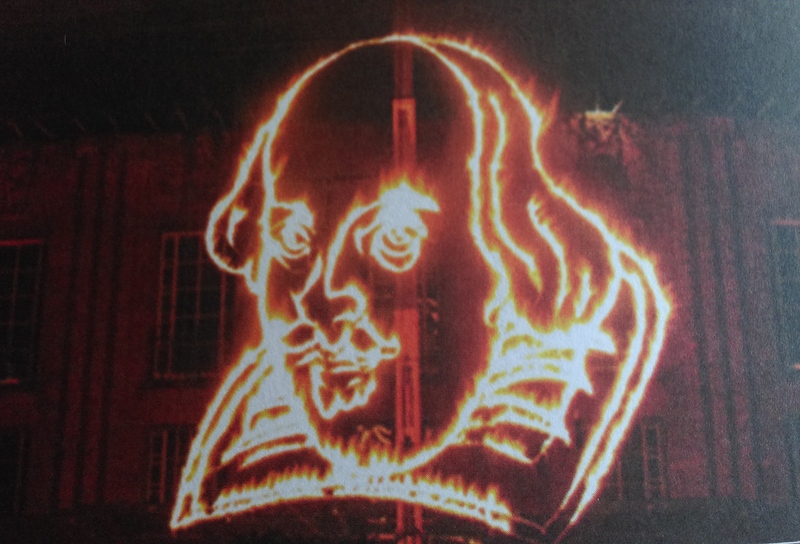 Good point Annie – I’m starting my quest with a book by Diana Price – Shakespeare’s Unorthodox Biography, which rather than leaping to point out alternative candidates, seeks to establish actual knowns about Shakespeare and disentangle them from conjecture. Lots of meaty stuff to get your teeth into. Glad you’re interested, I’ll report back here as I go along. Beautiful blog post, and a real treat to read about identity, Shakespeare, and Wolf Hall intermingled to create such a beautiful piece. Here is one thought that struck me about personal identity: I’ve noticed over the years (I’ll be 70 this year) that my idea of self is in constant flux but my sense of myself – my Self – is pretty constant. It all depends on our perspective and our purpose for the search. Seeking out the identity of Shakespeare sounds like fun. I studied him in college, focusing mostly on his works and gently dismissing the idea that anyone else wrote those plays and sonnets. So on one level, there is the mystery of Shakespeare himself, and on another level, there is the mystery of the real people he portrayed in his plays, like Richard III. I love what Josephine Tey did for my perceptions of RIII. And now Wolf Hall and Cromwell. I look forward to reading more on this subject (these subjects), and frankly, I’d read anything you write. Thanks for capturing my interest and my imagination. Now I have to reread Daughter of Time and get back to Wolf Hall. Thank you so much for your comments – I’m very interested in your thoughts about ‘self’ – I wonder about this a lot – and I sometimes feel so different to the self I was just a few years back, it intrigues me to know if I’m discovering the ‘real’ me or just changing over time and with experience – as with so many other aspects of life, I think of it all as a journey, or a cycle. Like you, I studied Shakespeare years ago, and I don’t recall anyone ever questioning the authorship then, but even spending just a little time scratching the surface raises all sorts of queries. I rather like the idea of studying the various ‘camps’ and drawing my own conclusions – so pleased you’re interested too. I do hope over time as I manage to report back on what I’m reading/thinking that you’ll let me have your thoughts too. What a great post. The only problem is that it makes me want to sit down and talk to you rather than type! It is a conversational post. Identity is so fascinating and so fluid yet so fixed. Love this. I shall follow your shakespeare quest with interest. And yes too to Wolf Hall and Hilary Mantel’s extraordinary achievement, and Mark Rylance’s too. I was totally won to a more sympathetic understanding of Cromwell and would have said that was quite impossible from what I knew beforehand. Oh Elizabeth, thank you, that’s lovely. So far, I’ve read Diana Price’s Shakespeare biography and Mark Rylance’s play – I Am Shakespeare, and already know more about Shakespeare than two years doing A level Eng Lit ever taught me! But oh wow, the questions. I started with Price’s book, because it seems to be the most even-handed look at the evidence available, but now I need to venture out into the territory of the Stratfordians and the anti-Statfordians, where it appears to get much more emotional. My plan is to post again soon, summarising the key bits of evidence as I understand it (it seems to me that some facts feel important while others more trivial, but they all tend to receive equal coverage), and then hopefully, I’ll be able to hold onto those facts as I wander off into biased camps. Never a dull moment! I don’t know how I missed this, but I’m glad you linked to it from your latest post. Fascinating stuff and I’m agog to follow you on your journey of exploration. Glad you’re interested – I think this may well keep have me hooked in the same way as your ancestry project.